Eastern Mennonite University students and an alumnus were among the volunteers at a Remote Area Medical (RAM) clinic in Harrisonburg on March 2 and 3. Based in Tennessee, RAM has offered dental, vision and medical care at over 1,000 clinics in the United States since 1985. In Harrisonburg for the first time, the clinic, which relies on volunteer providers and workers, provided 371 dental, 307 medical, and 287 vision care appointments to 601 people over two days at the Rockingham County Fairgrounds, organizers said. Nathan Ropelewski helped with clinic setup, and Sitasma Khatri assisted patients on the clinic’s first day. Both biomedicine graduate students and members of EMU’s Pre-Student Osteopathic Medical Association, they were “blown away” by the clinic’s magnitude and the high numbers of both patients in need and eager volunteers. “It was huge,” Ropelewski said. Some patients, Khatri noted, traveled for hours to be seen, sleeping in their cars and waiting in line for hours through the night. One had even walked there from Timberville, a trek of over 20 miles and eight hours, according to organizers. 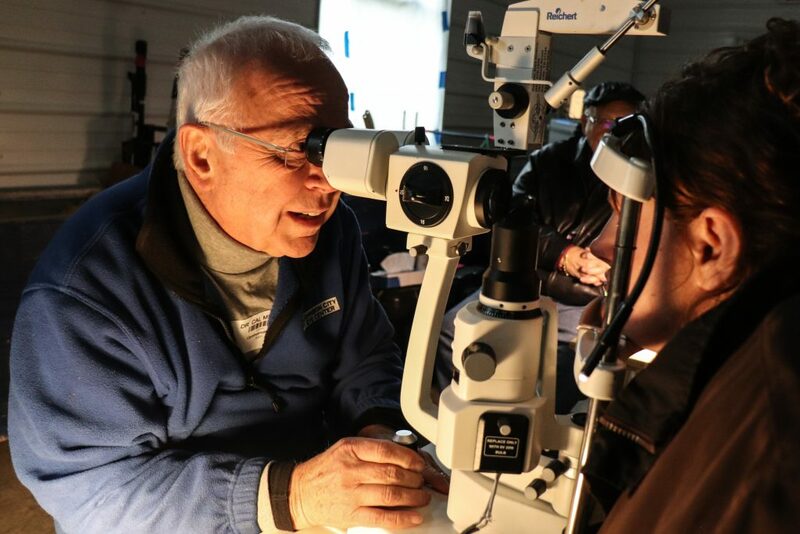 Retired ophthalmologist and Rockingham County resident Calvin Miller ’66, who has volunteered at RAM clinics for 15 years and was featured in a WMRA report about the event, said that his decades of practicing in medically underserved areas have exposed him to “lots and lots of folks” without full access to eye care. Many other volunteers, too, flocked to the clinic, including from across state lines.